Mahira Homes Mahira Homes 103, located on Dwarka Expressway, is the perfect place for your abode, situated in the beautiful region of Gurugram, in sector 103. Mahira Homes Sector 103 Gurgaon is the second group housing project of Mahira Group, known for its work in the construction industry for the past 25 years and delivering quality to its customers. This project is aimed at making homes luxurious and smart without costing the price to nature. So what you get by being a part of this township is not just a priceless home, but also unique views, peaceful surroundings and a great community to stay with. Mahira BUILD TECH PVT LTD is a successful and sustainable real estate company, and with our New Launched projects, we are looking forward to expand in future, making high quality affordable housing available in other cities as well. Each of our residential unit is built on the foundation of good quality raw material and fair financial practices; early RERA registration have made our honesty and transparency more evident. 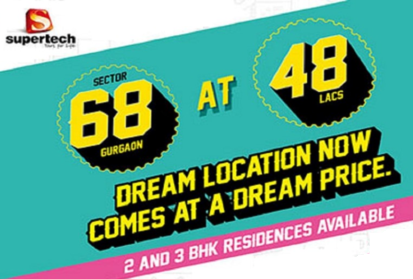 Mahira Homes, one of the most stunning yet affordable homes which will be near to NH-8 Road in Sector 103, Gurgaon. The project comes with the choice of various layouts of 2/3BHK apartments. The Pricing is one of its core Strengths as it is just 4000 INR/sq.ft and 500 INR/sq.ft. Mahira Homes under Affordable Housing Policy 2013. Spread over a huge 5 acres of land, Mahira Homes 103 Dwarka Expressway is everything you wish to be yours for a home. The township will be replete with amenities like parks, play areas, gymnasium, jogging tracks, amphitheaters and a sports clubhouse. All the designs and plans match international standards which serve as a proof of the quality that is promised to all the residents of the township. All these facilities and affordable prices make Mahira Homes 103 Gurgaon one of the best townships in Delhi and NCR, and also one of the best places to live in Gurugram. The proposed schemes are carefully crafted to suit all your needs. 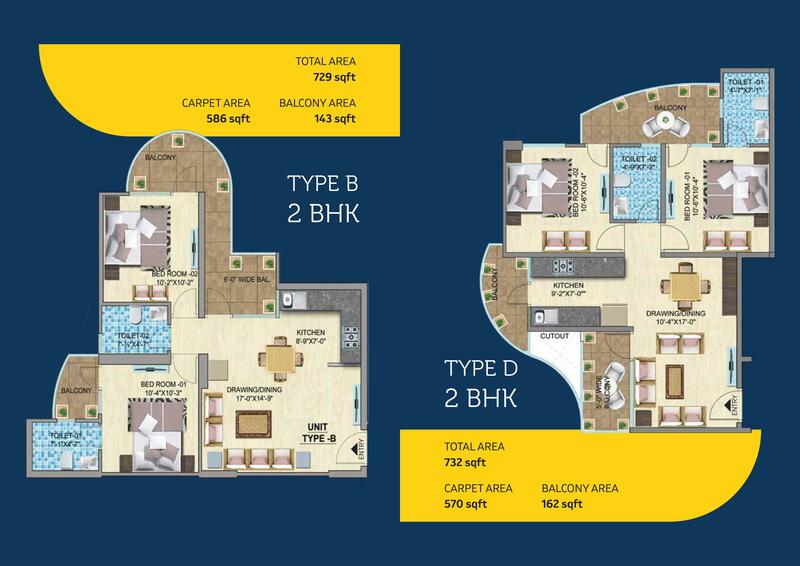 With around 800 flats in the township, the Group offers you multiple choices in 2BHK and 3BHK options of flats. As promised, the township has ample sunlight, open air and is very calm as compared to the rush in the city. Mahira Homes is also located at an easily accessible distance from the main city and is also very close to NH8, and also the Airport, so that traveling is not a problem for the residents. Colonizer /Developer: M/S MAHIRA BUILDTECH PVT. 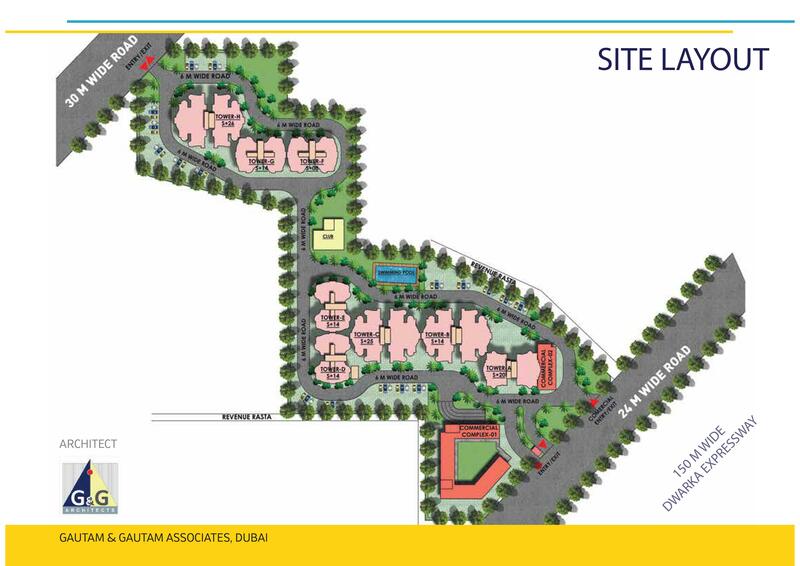 LTD.
Project Area: 5.4037 Acres comprising a total 800 flats out of which 5% Flats reserved for management quota and 95% for public. Zero maintenance for 5 years. 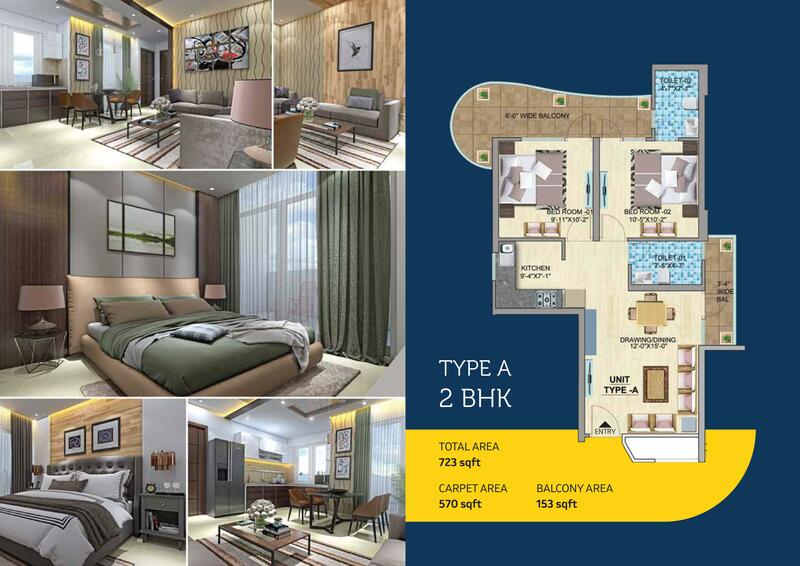 2 BHK / 3BHK spacious apartments in various layout. National Highway-8 and Dwarka Expressway is very close. Excellent workmanship that last for years. High quality doors and windows. Exclusive children and creche area. 24X7 power supply and CCTV observation. Kitchen that will make you proud. Mahira Homes 103 Sector 103 Gurgaon is one of the most premium residential location in Gurugram. The serenity and tranquility of this posh area paired with modern facilities is a perfect mix of urban lifestyle. 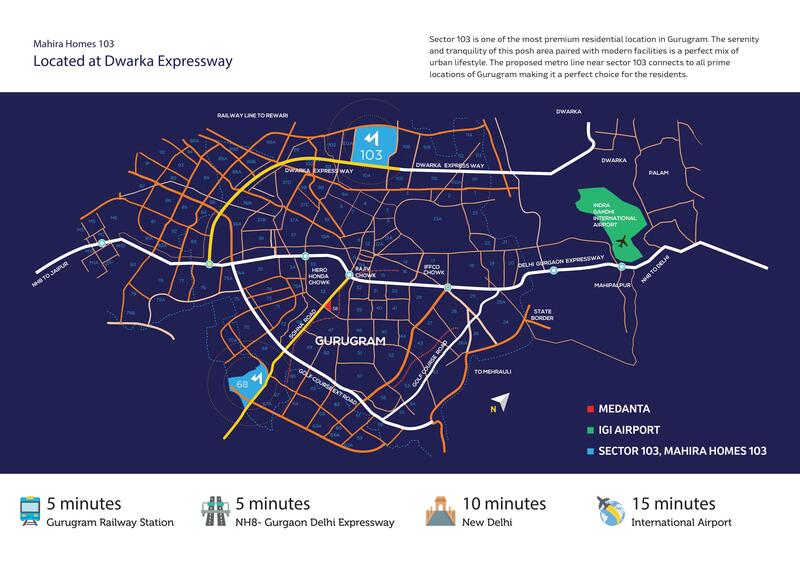 The proposed metro line near sector 103 connects to all prime locations of Gurugram making it a perfect choice for the residents. 24 meter wide approach road. Located on main Dwarka Expressway ,Gurugram. 2 Minutes away from proposed metro station. Easy & Smooth accessibility from NH-8. 5 minutes Gurugram Railway Station. 5 minutes NH8- Gurgaon Delhi Expressway. 15 minutes Indra Gandhi International Airport. Business hubs and corporate offices nearby. Best hospitals to provide the best care in close vicinity. World class schools around for education. Any person can apply, however, the PMAY beneficiaries, which include their spouse or depended children, identified by the Urban Local Bodies Department, Haryana under “Pradhan Mantri Aawas Yojna-Housing for All” programme shall be granted preference in allotment. First priority shall be given to the identified beneficiaries of the said town followed by other PMAY beneficiaries of the State of Haryana. Thereafter, for the remaining flats, persons which include their spouse or dependent children who do not own any flat/plot in any HUDA developed colony/sector or any licenced colony in any of the Urban areas in Haryana, UT of Chandigarh and NCT Delhi shall be given next preference in allotment of flats. An applicant in a specific colony shall make only one application. Any successful applicant under this policy shall not be eligible for allotment of any other flat under this policy in any other colony. In case he/she is successful in more than one colony, he/she will have choice to retain only one flat. All such applicants shall submit an affidavit to this effect”. Application Form cost -RS. 1000/- is discounted for our old Costumers.